All biker jackets may look the same, but that’s about to change. This variety will give you a much better option on what to choose the next time you want to wear a jacket. The Women Black Leather Jacket is a perfect example of a fashion statement. 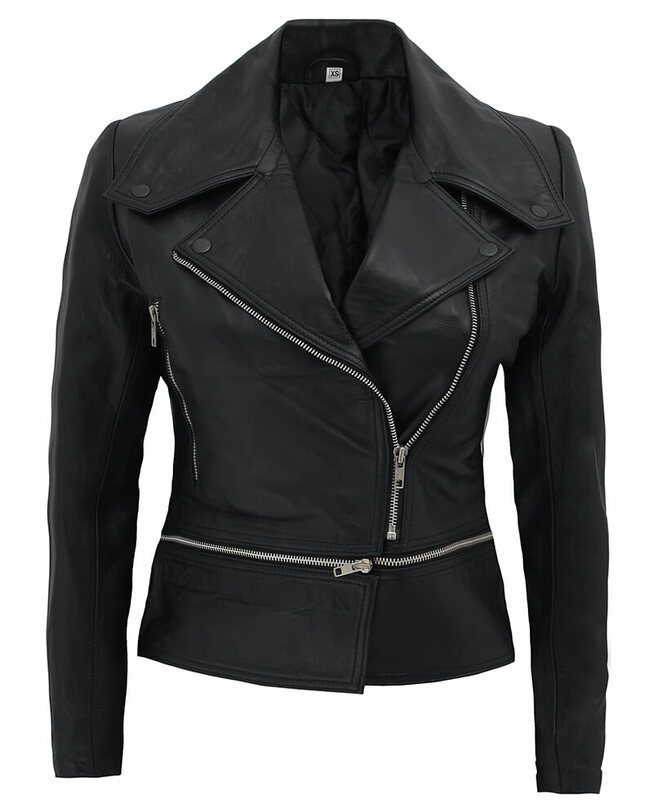 The Womens Leather Black Jacket is crafted from real leather. It is tough, ideal and can last longer. The jacket has a classic collar with front zip closure. YKK zippers are used on the outfits for smoothness and durability. Its sleek cut can make you look gorgeous and fashionable regardless of what you wear underneath it. Similar leather jackets for women also available. Keep it simple in the transitional months with the black leather jacket women in biker style. A wardrobe staple that makes any woman instantly look astonishing due to its elegant features and quality leather finishing. No matter how many times worn, its job to make you look good and feel comfortable will never end. Ordered a leather jacket for my wife as a gift and the quality is very good for the price. I was looking for a biker type jacket, just to wear for fun. I bought a “pleather” version prior, and it was so uncomfortable to wear, because it didn’t breathe like real leather. Then I found this jacket!! The leather’s sooo soft and the fit is dead on if you follow their guidelines. The slim fit is very flattering, and it’s both warm & breathable. Love this jacket!! I really have been impressed with the excellent customer service at Film Jackets. I am 5'3 and 150 pounds. Usually wear small but ordered a medium and it's perfectly with my body. If I am not mistaken, it looks more like a negan style jacket designed for ladies. I also found the inner lining comfortable which is one reason why I always wear this jacket. Not restricting my movement at all. I am not a biker, but I must say this women black leather jacket really caught my attention so thought about trying it out. I am currently wearing this jacket, drinking my cappuccino and writing review for this amazing product. Rock on Fjackets! The shoulders were the highlights of the jacket. I chose to wear the jacket without zipping it because it looks better that way since it has a gorgeous shape. The five stars are for the craftsmanship.